Ribbon is one of those dorm room decorations items that you don't think of often. Which is understandable. When you're thinking about dorm room decorating for the holidays, you're focused on your dorm Christmas tree and how you can make it stand out from everyone else's. After all, you want your dorm room to feel like a home away from home and that means making your college dorm room unique. For unique accents to your college dorm room decor, add our 23' Baby Blue Glitter Ribbon! 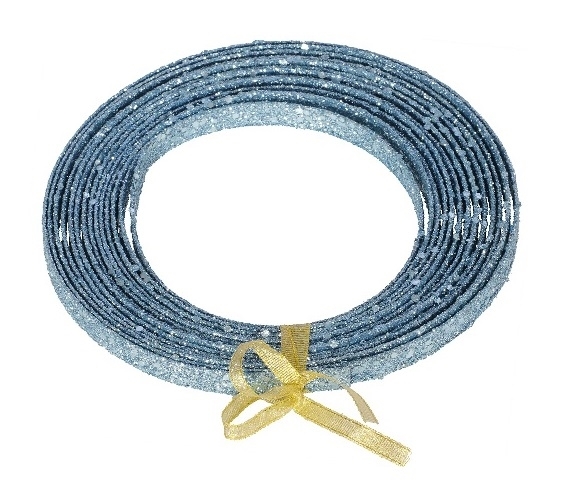 Our Baby Blue Glitter Ribbon is a sturdier, thicker ribbon than most. The sturdy design of this college supplies item makes it ideal for both dorm room decorating and gift wrapping. You can wrap this dorm essentials item around your dorm Christmas tree for a complete and stunning look to your college room decor. Think of how great your dorm Christmas tree will look decked out with mini dorm lights, garland, Christmas bulbs, and our Glitter Ribbon! Plus this multi-purpose dorm item will be the perfect touch to the awesome gift you got mom for Christmas!